If you have ever puzzled over a question “how to get dry erase marker off wall” then you had this situation when your child had painted the wall with this type of marker or your hand had accidentally jumped off the whiteboard. The mark of the dry erase marker can be easily cleaned from the wall without anyone’s help. It’s not necessary to buy any expensive unique means in the stores. You can cope on your own, using available tools to remove dry erase marker from wall. The marker can be removed with alcohol. Please note that the only suitable one is with alcohol content of at least 45%. Just wipe the soiled area with a rag dipped in alcohol and that’s it. It’s another effective way to remove the marker stain. Plentifully spray the lacquer on the polluted area and wait for it to absorb. Then take a piece of cloth and rub in circular motions, and then wipe the area with a damp cloth. It should be noted that this method is not suitable for all type of walls, as you can remove a layer of paint. To avoid it, try this procedure in a separate section first. You can buy it in a hardware store or online. A miracle sponge is able to clean any surface from various kinds of stains, including dry erase markers on walls. Rub the dirty surface with a sponge moistened with water. If it wasn’t possible to remove the marker with the first try, just repeat the process. This method is suitable if the marker stain is fresh, and probably the simplest one — you only need to rub the polluted area with an eraser. This remedy is strong, so you need to handle it carefully. To avoid the wall damage, you need to try to apply acetone on a small piece of the surface first. If the paint from the wall isn’t gone, then feel free to use acetone to launder the trace of the marker. Wipe the polluted place with a piece of fleece dipped in acetone. If the stain is old, you will have to repeat the procedure several times. Every woman who cares much for her hands has an acetone-free nail polish remover. 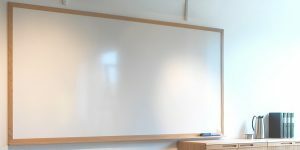 In order to clean the wall from the dry erase marker, it is necessary to apply a large amount of liquid on a cotton pad. Wipe the soiled area with a wetted disc. Leave the agent for 15 minutes, and then rinse it off. Such products are considered effective because they contain chemicals. Before you start using it, read the instructions first. Some stain removers may remove the paint from the wall along with the writing, so try first on a small piece of the surface. Apply the product and wait for 10-15 minutes. If the paint remains in place, then the stain remover can be safely used. One of these methods will surely help you with removing dry erase markers from a wall surface.